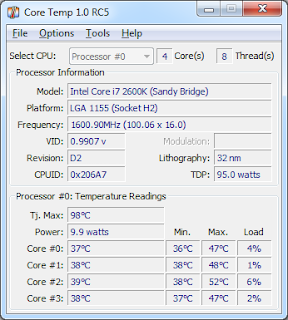 CPU Core Temp is a free compact CPU temperature monitoring software that allows you to see how the CPU temperature varies when you load your CPU in real time. The uniqueness of Core Temp is that it shows the temperature of each individual core in a each processor in your system. CPU Core Temp monitoring tool comes extremely handy for overclocking to check CPU temperature stability. It is also good idea to check CPU temperature after installing, re-installing or upgrading computer hardware. Core Temp supports all Intel Core and Core 2 series of processors as well as the whole AMD’s AMD64 line of CPUs. Download free Core Temp for Windows. Core Temp file size 1.3MB.